But the underlying problem remains; to date, there’s no good way of determining what levels of THC in the bloodstream are dangerous, or even whether that’s an accurate metric to determine when someone is under the influence of marijuana. Last September, NPR published on its website an article entitled “The Difficulty of Enforcing Laws Against Driving While High,” which explained how states that have legalized marijuana are having difficulty with this DUI issue. Colorado, for example, set the DUI level for cannabis intoxication as five nanograms of THC per milliliter of blood. But researchers quoted in the article pointed out that THC isn’t a good indicator of intoxication, since it’s stored in the fat cells and isn’t soluble by water like alcohol is. That means a positive test for the presence of THC only shows that at some point—perhaps a week ago or longer—the person ingested marijuana. The test doesn’t measure the level of intoxication from the drug at all. In another article on the NPR website, a researcher said that the amount of THC in the body could also vary by whether or not the person used cannabis only occasionally (in which case the THC would leave the body quickly) or fairly regularly (in which case it would be stored longer term). That occasional smoker, stopped by police within a few hours of using pot, could actually be much more intoxicated than a regular user but would have much lower THC levels in their bloodstream. The way that a person ingests cannabis also impacts THC levels. Smokers generally have much higher levels than those who ingest it through eating pot-laced products. There’s little doubt that law enforcement officers would welcome the development of a breathalyzer for cannabis. There are many articles online featuring police officials who bemoan the fact that they don’t have this essential tool. But those officials also echo doubts about how accurate such tests could be because of the uncertainty over the effect of THC levels. To get around that problem, the developers of breathalyzers for cannabis appear to be focusing on ways to detect the active presence of THC in the bloodstream, which they claim is a better indicator of intoxication. Cannabix Technologies Inc., based in Vancouver, British Columbia, Canada, has been working to bring portable hand-held tools to market that could improve law enforcement’s ability to measure marijuana-impaired driving offenses. 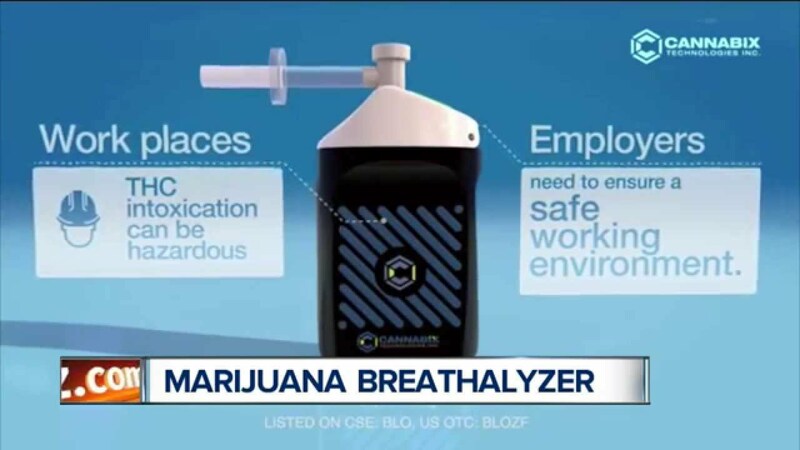 The company has developed drug-testing devices that will detect THC using breath samples. But the company says that it is focused on “developing breath testing devices for detection of recent use of THC, in contrast to urine testing for THC metabolite that requires an invasive collection and reflects use days or even weeks earlier.” They define recent use as within two hours. In a video on the Cannabix website, company representatives point out that the only way to currently determine THC levels in the bloodstream is by taking a blood test. But THC disappears quickly from the bloodstream, and blood tests can take weeks to process. So their work is focusing on instant readings of THC presence. At the end of March 2017, Cannabix Technologies announced that it had successfully completed preliminary human subject testing of its products. But there’s still one major drawback with its technology; it only works when people have smoked marijuana, not when they have ingested it in other ways. Oakland-based Hound Labs says it has that omission covered. According to its website, its proprietary Hound® technology can measure both smoked marijuana and edibles and can measure the presence of both alcohol and marijuana. Hound Lab’s breathalyzer can also store breath samples for independent verification at a later date. Like Cannabix, Hound Labs says its technology will pinpoint those who have used marijuana recently. At the same time, its technology will ensure that unimpaired individuals who may have THC in their saliva or blood because of previous use aren’t wrongfully accused of impairment. The development of alcohol impairment standards is a good model. Police used alcohol breathalyzers before the existence of legislation dictating what concentrations of alcohol in breath correlated with impairment. They used the measurements at the roadside as one more piece of data to inform their decision-making process. Having objective data allowed law enforcement to make appropriate decisions on how to proceed and avoid wrongful detention. Use of the Hound marijuana breathalyzer not only provides information that is immediately useful at the roadside, but also allows ongoing data collection to inform states on how much THC is too much to drive. Cannabix Technologies and Hound Labs hope to bring their marijuana breathalyzers to market within the next year or so. But the controversy over the accuracy and effectiveness will continue for much longer, as defense attorneys for clients accused of marijuana DUI are likely to challenge the results of those breathalyzers and the use of THC as a measure of intoxication.